ArLiSNAP (Art Library Students and New ARLIS Professionals) and VREPS (Visual Resources Emerging Professionals and Students) are joining forces to host a virtual conference this May! 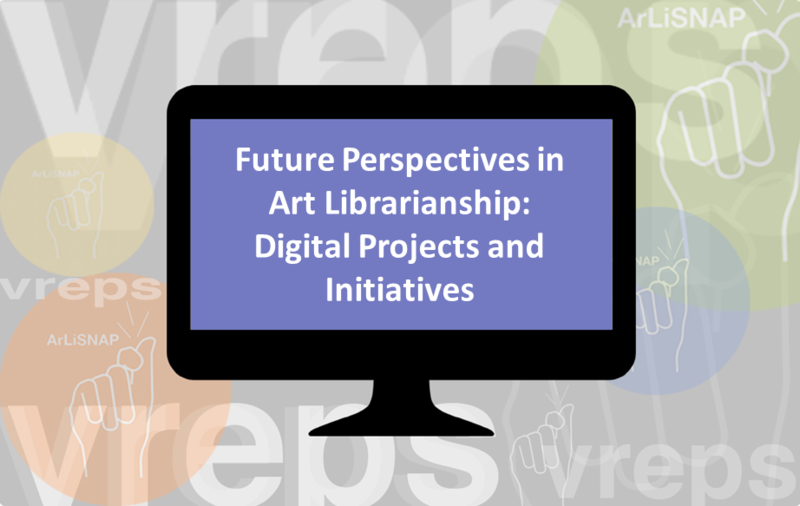 The conference, Future Perspectives in Art Librarianship: Digital Projects and Initiatives, will take place at 12pm CST May 21, 2016. The conference will consist of a keynote speaker followed by 1.5 to 2 hours of presentations by students and new professionals. This is an excellent opportunity for those who cannot be physically present at our annual conferences to share projects and ideas. Our keynote speaker will be Sara Rubinow. Sara is a Metadata Specialist in the Metadata Services Unit of NYPL Labs, The New York Public Library’s digital innovation unit. Prior to NYPL, Sara worked on projects involving the collections database, digital initiatives, and printed matter at Cooper Hewitt, Smithsonian Design Museum. Sara will discuss her role at NYPL Labs and showcase initiatives intended to engage developers, scholars, artists, and the general public in exploring—and transforming—NYPL’s digital resources and open data sets. We are looking for students and new professionals with an interest in art librarianship or visual resources management to present their work. The theme for this year’s conference is focused on digital projects and initiatives. Have you been working on a project using technology in a new way? Do you have thoughts to share on topics such as metadata and visual resources, copyright and the arts, digital collections, or visual literacy? Would you like to share your work with the ARLIS and VRA communities? Submit your proposal, and add your voice to our discussion on the future of the field! Submit your proposal via this link by Friday, April 1st. If you have any questions about this event, please don’t hesitate to contact Breanne Crumpton, ArLiSNAP Conference Planning Liaison, at becrumpton [at] gmail [dot] com.